I have been remiss about my yard lately, including blogging. But last week I got out there to check things out and water; it had been a long time since we had had precipitation, although things were looking good. And I saw some very interesting things. Today I was reminded by the local curve-billed thrasher (Toxostoma curvirostre) at the feeder that I have not yard-blogged in quite some time. I let the feeder go empty for almost a month, I think, and the birdbath too. But my winged friends came back instantly when I filled the feeder and birdbath. The commoner birds come back first; there were more house finches than I'd seen before, and the juncos arrived a couple of weeks ago, just about when I got more attentive to their needs. The curve-billed thrasher, I had thought, was a summer bird, but my Birds of New Mexico field guide says that they are year-round residents. That first photo was one of the interesting things. 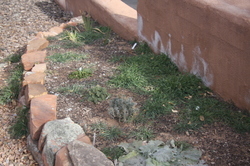 I dug out the matted roots of cheatgrass a year and more ago from that bed, and covered it with mulch. That has worked well in other beds, but there must have been a lot of seeds in this one. I've planted a number of things in that bed that I bought at the native plant store at half-price in August. I'm not proud of this bed right now; the cheatgrass will come out rather easily, so that's not it. Rather, I'm concerned about the composition of the bed. The irises down at the narrow end are okay and should fill that part in another year or two. I bought them from a fellow at the Farmers' Market who advertises recycled plants. His iris prices are cheap, and the ones I have look so good and require so little care that I thought I'd add more in the open beds. But there is a variety of other things, and I'm not sure how they will look together. Some will die, of course, and I can replant others if necessary. I've done it before, several times with my Russian sage (which is actually native to Pakistan), and they're now very happy where they are. That second photo is of a geranium that has some name like blood-leaf, referring to the fact that the leaves change color in the fall (duh!). I'm not going to google it just now for a link; it has very nice purple flowers for too short a time in the spring, but the green is nice and they seem to be happy under a juniper. I bought three of them early in the garden project, and one died. Or seemed to. It (or a seedling in the same place) returned this year. Frost came too soon last year and killed the leaves before they could turn. 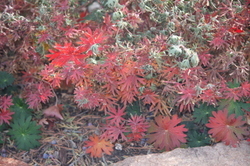 The top leaves are crisped, but there's some nice color this year. Finally, every time I look at my prickly pears I am reminded that I want to include them in a yard blog for their good desert citizenship. Look at how those left-hand pads are stopping the soil from eroding downhill. Because my yard is hilly, practically every prickly pear works hard at this. The pads in the soil then develop roots and send out more pads across the mini-arroyos. I took photos of three this morning; this illustrated the process the best. And this is a cactus that was there, not one that I planted. 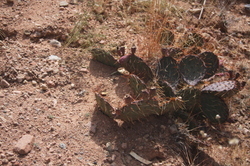 The benefit for the cactus is that it gets more of the water that washes down the hillside during rainstorms.